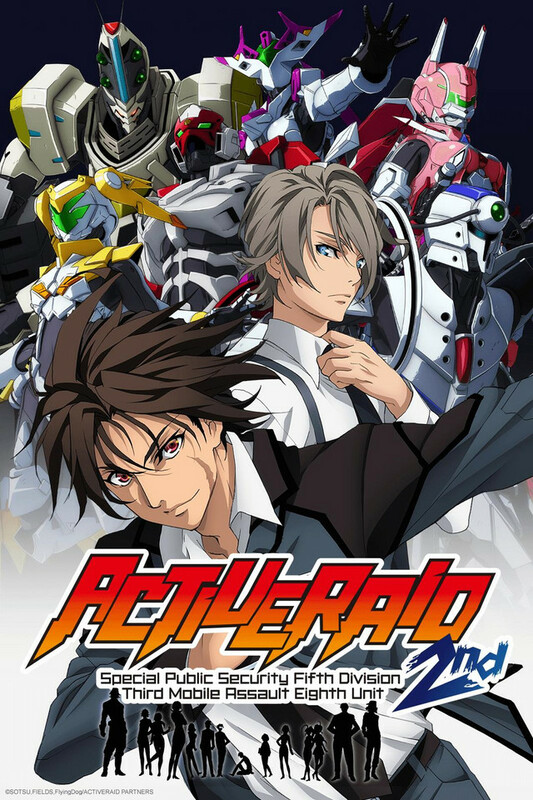 Contrary to what some might have imagined, Active Raid wasn't trying to be Patlabor or Psycho-Pass. No, it's actually closer to the Power Rangers, especially their Japanese equivalents. Look up Dekaranger, which was made by the same writer and was turned into Power Rangers SPD in the West, and you'll get a better idea of what is going on here (plus this guy was also responsible for the even sillier Akibaranger parody). In other words, it's one of those shows that isn't trying to be too serious, ambitious or dramatic in any real way. That might annoy or bother those viewers who prefer grand tales of adventure or crazy over-the-top action shows, because they will be bored by the lack of substance, but I think this isn't a problem for those who can sit back and relax. Either way, I will argue there were a few particularly good episodes, such as 6 with the giant robots and 8 with the lovers' quarrel. The power suit action was also pretty nice in terms of 3D work, though it was often used as part of the jokes and not to raise the stakes. Overall, I honestly found Active Raid season one to be pretty satisfactory as lighthearted fun. Nothing special, but nothing terrible either if you know what to expect and aren't asking the show to become something completely different. There are some Anime I just don't get. Sometimes, the concept doesn't grab me and other times, it's the execution that I feel is lacking. With Active Raid, it's probably both, even though it's hard to tell just by judging the very first episode. But this mecha Anime has made for a bad start into this new Anime season for me. The show focuses on Kazari Asami, who is tasked with leading Unit 8 of the „5th Special Public Security Section’s Mobile Assault Division”. Which is a fancy way of saying: It's policemen in mobile armor suits. In the first episode, we get introduced to a bunch of character of said unit that is also called the “garbage unit”. Of course, Kazari Asami doesn't fit in right away and is pretty useless until the end of the first mission, but at least we get a nice overlook of the characters, though it can feel a bit crowded in the first episode. Even though this story should work on paper, the first episode really drags on. That's mostly because the pacing is awful and the combat sequences lack impact. Worse, the few attempts at humour fall completely flat, since the timing is off and the writing is full of clichés. Same goes for the characters that we've all seen at least a hundred times in other anime. On the plus side, the animation looks rather nice, with some neat 3D-Animation thrown in for good measure. But unfortunately, that alone doesn't save this first episode from being a complete bore. I'll give this series a second chance, but if the second episode doesn't improve, this will be the first series I'll stop watching this season. Hey, a "review" that actually has been written after the 1st-story-arc / "cour" and voted 5 stars just to balance out "false-reviws"? Awesome, let's do this! Oh, and of course like nothing in this world, there will be spoilers, you know like this one you already revealed, huehue! Like some earlier non-"first-episode-only"-reviews have pointed out, the main theme in Active Raid is the near'ish future world being powered by both quite-high-tech-power-suits and loads of cyber-technology hidden within mundane technology. All this, especially police-forces, being heavily held down due the super-territorial politicians. This series is not exactly cyberpunk especially with the lack of human-augmentation-cybernetics and such. In fact, aside for the robot-suits and some of the more advanced vehicles the governmental-forces use, the technology for the most part is just more fine-tuned tech we currently still have in 2016. For starters the story is very self-contained: There's a beginning and ending. Of course, as some might have already mentioned, there's a huge load character backgrounds being left untold. Or perhaps just enough for the case(s) in hand. It's a very subjective thing: I for one personally think I know enough of these characters to be likable and relatable without necessarily knowing their childhoods or every other details of their past or thoughts or anything similar; a very nice change in the backstory-scenery. We'll see how this changes once the 2nd-cour / season begins (hopefully) on July 2016! So far this has been a really good base to build upon more stories. Very good sci-fi-series so far in sense of "making marvelous seem mundane" and fun. There isn't too much more to say. The series starts with a cliched cast of characters, and uses the episodes to explore their backstories (poorly) while shoehorning in the overarching plot versus the big bad guys. There really aren't any surprises, and you can see twists coming from a mile away. I can really only recommend this series to people who're looking for a way to waste time. Or maybe bland action anime with a flat cast of characters is your thing; in which case, I guess I would recommend it. Cringe-worthy at times, but great fun! The first season of Active Raid is a fairly average show. The concept is that power armor known as "will wear" become commonplace in the near future for industrial, military, and law enforcement purposes. The show follows a group of police who use this technology to stop crimes. It doesn't take itself seriously by any means, and both the criminals and officers are completely over the top. There is a high cringe factor for some episodes. Season 2 takes what was done in the first season and dials it up a notch, adding new characters and plot lines. Although all of the characters from the first season do eventually return, we don't see nearly enough of them because the writers had to make room for the new characters. While I think everything flowed better in the second season, I don't think most of the new additions to the cast added much to the show. I would have preferred seeing the original cast all come back full time, with the addition of maybe one or two characters. So why the high score? The show is just a ton of fun to watch. If you are a fan of the mecha and comedy genres, give this a serious chance. I'm honestly surprised that the score is so low. It's not the greatest anime of all time, but it at least succeeds at being entertaining. This was a good anime in my view, not excellent, but good. It looks like, based on the reviews, it's a love or hate series. I liked it. There wasn't much plot, there was plenty of action. I do want to say, season 2 was much better than season 1. I wonder if there will be a season 3. Its actually quite good but doesn't play to strengths.